I hate to waste edible food. When I get greens from the farm share, I prefer to use the entire stem. You will rarely find me using a recipe that calls for, say, discarding Swiss chard stems. 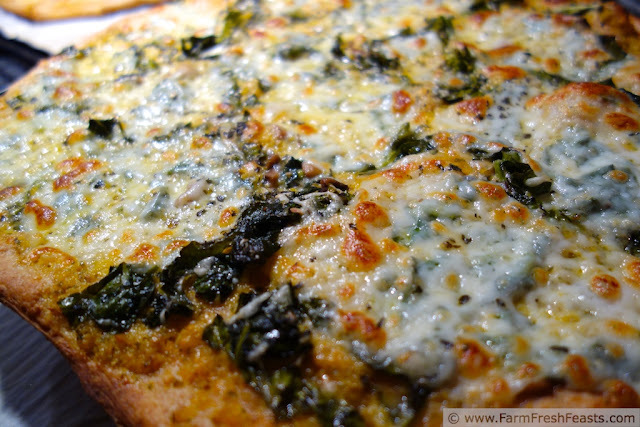 But when I read in the farm share newsletter that the stems of broccoli rabe (adorable how spell checker changes this to 'broccoli rage') could be used like asparagus, I decided to use the rest (leaves and florets) in a pizza. With mushrooms, because I think they have that whole 'earthy' thing going on together. As usual, I couldn't decide between sauces for the base. So this recipe uses an amazing tomato pesto sauce recipe I got from Heather at In Her Chucks. The sauce is so light and fresh that I kept the toppings simple and it turned out pretty good if I do say so myself. Oh, and what did I do with the stems of the broccoli rabe? I chopped them up, nuked them, and added them to tuna casserole. I do not recommend doing that. While they tasted fine, it ruined the familiar homey comforting that you expect from tuna casserole. Luckily my son ate all the leftovers. Other stuff going on in this picture-but that's my fresh tomato pesto in the bowl. Again, other stuff-this pizza has no meat or ricotta. 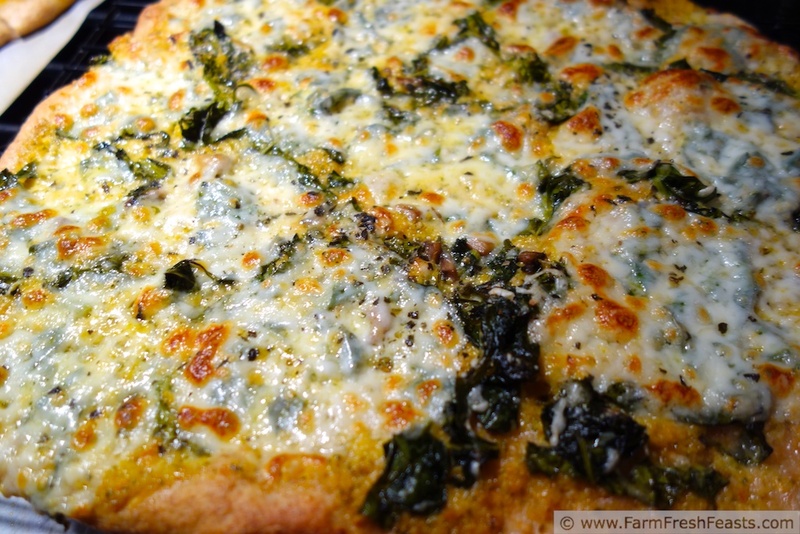 Gee, I wonder what the next broccoli rabe pizza will be? My mozzarella is too close to the edge! Pull back! Preheat oven to 450 degrees Fahrenheit, and a medium skillet over medium heat. Add a small amount of oil to the skillet. sauté the mushrooms 5-8 minutes until softened. Add garlic, stir. Add greens and 1 teaspoon water. Cover and cook 3 minutes until greens are wilted. Remove cover and continue to cook, stirring occasionally, until liquid is evaporated. This made enough for 2 smaller pizzas. On an oiled piece of parchment paper, stretch out dough into an approximate circle. Spread the fresh tomato pesto over the dough. Scatter half of the greens/mushroom mixture over the sauce. Add slices of fresh mozzarella over dough, keeping them in from the edges as the cheese spreads. A lot. Add fontina, Italian seasoning, and a tiny bit of seasoned salt over the entire pie. Bake on parchment (on a baking stone or a cookie sheet) for 5-8 minutes. 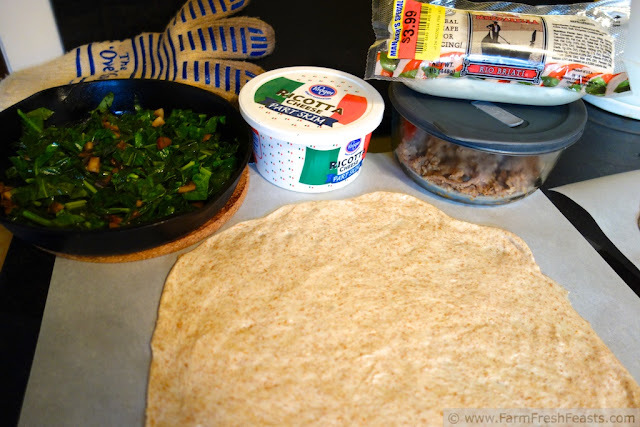 Shake the pizza off the parchment, and continue to bake an additional 5 minutes or until cheese is bubbly. Cool on a wire rack then slice and serve. 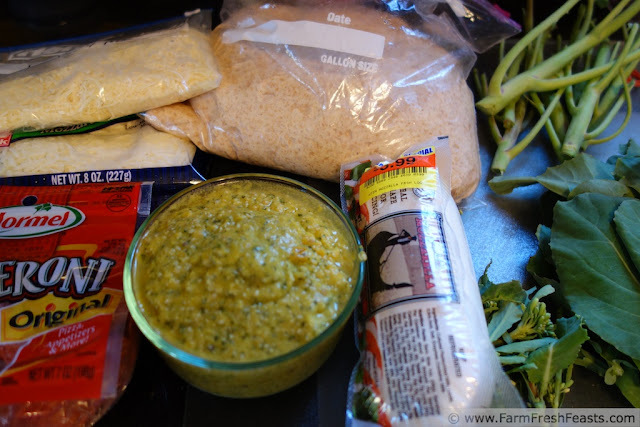 This post is linked with the Fresh Foods Wednesday Link Up and What's In The Box! Beautiful pizza! I have all of that in the fridge so when we happen on pizza night, I'll have to do the same. I hope you enjoy your pizza--and thanks for stopping by! Broccoli Rage huh?! I love that, and I love how spell checker questions the perfectly good use of the correct word (i.e. there, they're, and their). I think the spell checker is playing mind games with me. Anyway, this pizza just like all the rest looks scumptious. The big chunkc of fresh mozarella...mmmm. I made pizzas yesterday and thought of you. :) Hope you are still enjoying your Thanksgiving weekend. Meghan, my spouse is driving around Ohio spending the money he just got selling bikes in Zanesville on stained glass in Springfield, while I am typing up a post for next June and the kids and dog lie in sunbeams (with and without iPads, respectively). It's a good weekend. What kind of pizza did you make? I did beet and goat cheese, and liked it but will especially like feeding it to my folks tomorrow ;) when they arrive for a visit. Thanks for thinking of me while making pizza! Sounds like an ideal day. I'm with the dog; I'd be perched in a sunbeam too. I made a classic pepperoni for my non adventurous friends and then a pear, walnut and blue cheese pizza for me. I did share though, and I'll be posting some pictures and the recipe tomorrow. Yum! I hate to wate food, too. One of my favorite tricks is to save the stems from greens and use them in veggie stock. Great idea! I'm starting a Soup Pack for veggie stock, since I keep seeing great recipes that could be vegetarian/vegan if I had the right stock. Thanks for hosting! I learn so much at your link ups! kirsten - you are seriously inspiring me to make pizza. i have a pretty standard 1 or 2 i usually make but i'm venturing out of the box (get it? CSA? Box?) to make some new stuff. yours just look so friggin fantastic! Do it, just do it! but beware, the people you feed may force you into a weekly pizza gig. 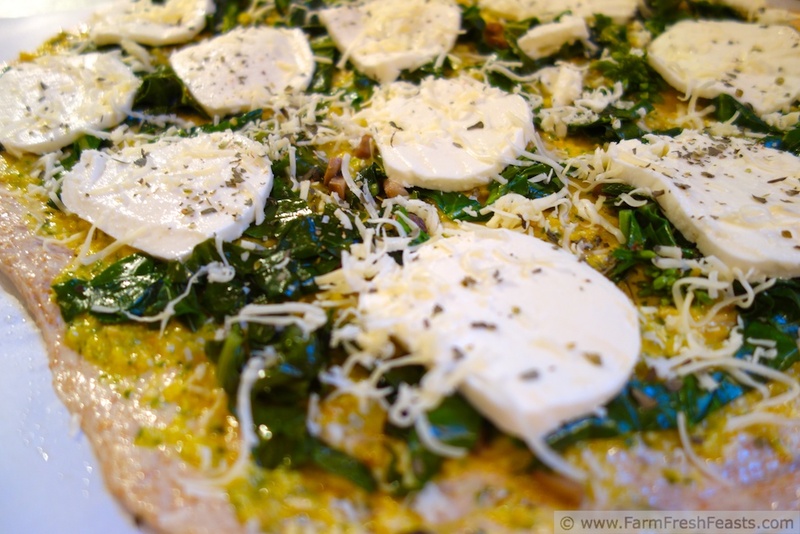 I only get creative making my pizzas because I keep getting all sorts of yummy veggies in the farm share . . . oh and this blog thing spurs me on too. I sure appreciate having places, like your Wednesday Fresh Foods link party, to share my pizzas with kindred spirits.